Are you looking for fun and interactive way to get involved in fostering a healthy environment on campus?! The student ambassador program is a student-led organization that promotes health, safety and wellness at Selkirk College along with guiding students to resources available on our campus. Find the Student Ambassador's office (The HUB) on the Castlegar Campus near the main entrance. 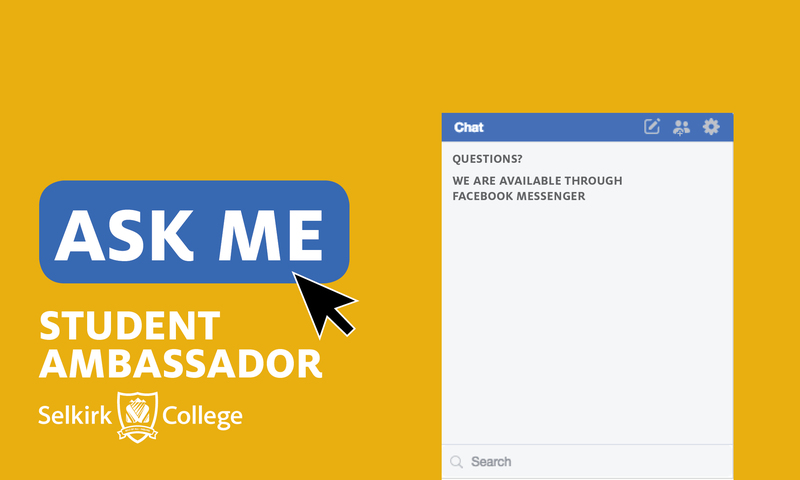 Follow the Student Ambassador on Facebook where you can also ask your Selkirk College questions through Messenger. 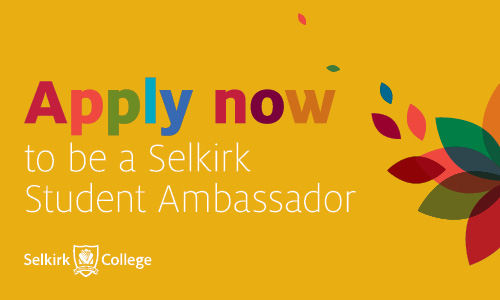 Become a Selkirk College Student Ambassador! Serve as a role model, advocate, and peer mentor to new and continuing students. Provide students with individualized referrals to campus services. Encourage and model involvement and engagement in co-curricular life and Healthy Campus activities at Selkirk College. How does the Student Ambassador Program work? Selkirk College believes that all our activities should help students achieve cognitive development, personal growth, and interpersonal effectiveness. That means that we will work with all our students to set goals, gain valuable skills, and learn in the areas that mean most to them. When you dedicate your time and efforts to be part of the Ambassador Program, we will dedicate our time and efforts into making sure you get the most out of your experience. If you are interested in becoming a Student Ambassador, please contact Leslie Comrie by email.